Black Perforated Faux Leather. Size XXL (44/46 chest). Quilted Warm Jacket. This is a fabulous jacket. Red And White Goretex Vintage Retro Sports Coat. Condition is Used. Dispatched with Royal Mail 2nd Class. Inspired by the Canadian Army tanker jacket that was designed for soldiers of armored vehicle, we take its own twist to refine the style and fitting – a modern fit with simplified details. This quilt mimics the feel of down but gives you the benefits of a synthetic insulation and less-bulky feeling. In good condition used. Length approx 27 inches. Shoulder to shoulder approx 24 inches. Sleeve approx 23 and half inches. Pit to sleeve hem approx 21 inches. 27" LENGTH, FROM NECK LINE TO HEM LINE. WITH ADJUSTABLE DRAWSTRING NECK AS PER PHOTOS. EFFETTO D’ITALIA chocolate brown LEATHER JACKET - exceptionally soft with stand up collar lined inside with ribbed wool, 7cm elasticated ribbed wool hem and cuffs.Very comfortable. Cleaning : requires specialist care. 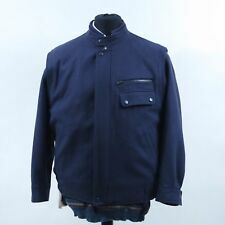 Classic Bomber Padded Jacket Coat Navy Blue. Excellent condition. Medium size mens bomber style jacket with ribbed cuffs and front zip fastening, white strip detail on cuffs and bottom of jacket. Only worn once . Lovely Jacket fully lined. Chunky concealed zip and press studs.